Veterinary Technicians, Assistants, Veterinarians and support personnel will find that the material covered in our advanced program better suited for their needs. Our certification classes are becoming the choice for veterinary hospitals and clinics to validate their staff training for accreditation. Recognize an emergency and understand what to do in a variety of situations such as allergic reactions, burns, bloat, choking, hypo/hyper thermia, dehydration, poisoning, shock and more. 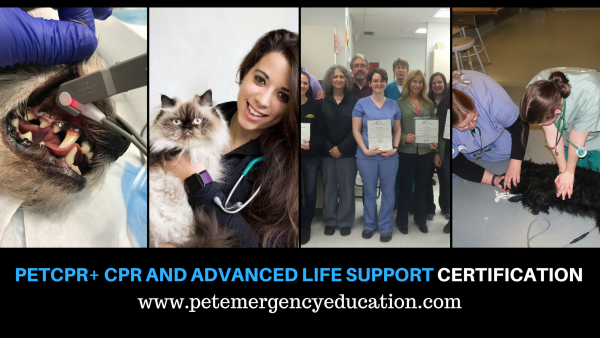 Learn how to provide client education on how to prevent and provide first aid for many common conditions involving their pets. Clinics may also request a customized lobby certificate to hang in their waiting room to promote that their staff is certified.